Are you a passionate and innovative Architect with experience on large-scale complex projects? Do you possess a commitment to document accuracy, design excellence, and sustainability? Do you enjoy meeting the client needs and building strong relationships, internally & externally? Do you thrive in an environment of collaboration, entrepreneurship and innovation? If yes, apply NOW to RMW. RMW architecture & interiors, is an innovative, award-winning architecture and interior design firm, with a collaborative culture. Our mission is to design engaging workplaces for great companies. 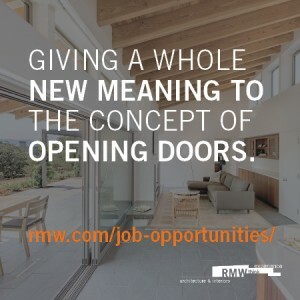 We are currently experiencing exciting growth and seek a Senior Project Architect to play a pivotal role in RMW’s Peninsula and South Bay Industrial portfolio. Meets with Client in collaboration with Project Principal and directs development of client’s program. Defines and plans design of work to meet project requirements. Coordinates with Project Principal on program, budget, and schedule for timely and appropriate design development. Coordinates consultants’ work during all project phases. Develops design alternatives to meet the client’s programmatic requirements, assures compliance with building codes, and assures technical suitability. Presents design alternatives at in-house design reviews. Develops presentation techniques that communicate the design concept(s) to the client. Manages the Project Documentation to ensure that design documents are in appropriate format to allow reuse in subsequent phases. Conducts construction observations, reviewing construction for general conformance with the design concept and technical requirements. Prepares, reviews, and evaluates cost estimates during all project phases. Manages production of Construction Documents with project team, including material/product research and technical detailing. Licensed Architect with Professional degree or recognized equivalent with 10+ year experience involving design, production, construction, and management. Experience on projects of at least 100,000 sq. ft.+, and/or projects of a highly complex nature with construction budgets of $5-50 million. Experience coordinating project resources, including an expanded consultant team, as well as in-house team staff of all levels. Demonstrable portfolio of high quality design projects. Broad understanding of profession, including design, technical, and regulatory requirements. Proficient knowledge of Revit and SketchUp software. Requires substantial experience in design development and detailing of all aspects on a wide variety of project types. Substantial knowledge of construction documents and ability of coordinate and set up project schedule, file system, and budget. Substantial knowledge of site-cast, tilt-up construction technique and entitlement process. Substantial knowledge of architectural planning, drafting, detailing, and building materials. Substantial knowledge of site design and a general knowledge of building codes and approvals process. For consideration, please email your resume and work samples to hr@rmw.com referencing the position title on the email subject line. No phone calls please. RMW architecture & interiors is an Equal Opportunity/Affirmative Action Employer.